Iveco is working on the next generation of heavy trucks. We showed a photo before that looked like it was a photoshop picture but these are for real! We do think this is still a design study, because the dashboard is still the same as in the 2018 model of the Iveco Stralis. The cab is very large, and much bigger than the Stralis HiWay. 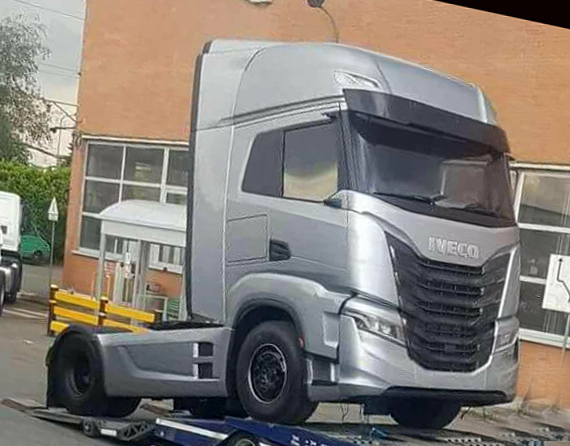 The sharp lines look good on the Iveco. Some lines do look familiar, like the black wheelarches that remind of the Volvo FH. On the photo’s of the exterior the mirrors are missing, and we thought that means this one gets camera’s instead. That was before we had the interior pics. There they are, on the bunk, and very large ones too!